From late March to early April of 2017, cultural ecologist and geophilosopher David Abram will co-lead an expedition to the Kalahari desert of Botswana, to visit and learn from a remarkable hunting and gathering community of San Bushmen, practicing the arts of tracking and bird language with an exuberant people whose culture is widely recognized as the most ancient and venerable human tradition still in existence anywhere on Earth. The other co-leaders of this life-changing journey will be the legendary tracker and nature educator Jon Young, and anthropologist and primitive skills expert Nicole Apelian. Jon Young and David Abram have known and learned from each others’ work for twenty years; they are delighted to have this chance to co-lead and learn together on this expedition. Dr. Nicole Apelian has been working closely with the Naro San Bushmen since 1995, and is currently collaborating with various Bushmen communities on a medicinal, edible, and traditional-use plant guide to the Kalahari basin. 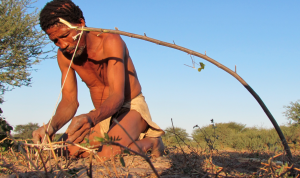 With this expedition, the Alliance for Wild Ethics is honored to lend its support and expertise to the Origins Project, an initiative working for cultural regeneration among San Bushmen communities in the Kalahari. 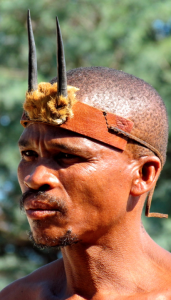 Started by Jon and Nicole nine years ago, the Origins Project works to bring a deepening sense of pride and self-determination to specific Bushmen communities, and to revitalize the very oldest traditions of human-earth reciprocity on the planet. Together we help to empower the intergenerational exchange of ancestral knowledge, practices, and traditions rich in song, dance, ecstatic trance, animal tracking, interspecies communication, plant knowledge, and low-impact flourishing skills – all of which are under increasing threat from harsh and exploitative land-development schemes. Those who have experienced Jon Young’s skills at tracking and bird language know that they are nothing short of uncanny. 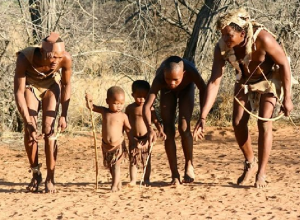 Yet the Bushmen are the very finest teachers of such interspecies craft and intelligence, and we will likely accompany them both in tracking animals, and in gathering and learning the ways of local plants. 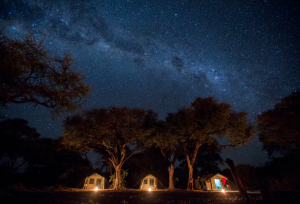 Evenings will be likely spent sharing stories and songs, trance dance and healing around the Bushmen’s fire. 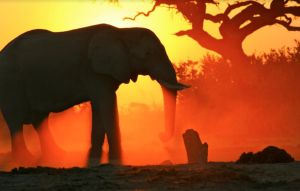 The latter half of our journey will be spent pooling our nature-awareness skills in the outrageous exuberance of the Okavango Delta, one of the most biodiverse or wildlife-rich places in all of Africa. No more than 12 participants will be accepted for this expedition. Our journey will start and end in Maun, Botswana, and will run from March 26th through April 4th of 2017. Funds raised by the expedition go toward cultural regeneration and self-determination for the Naro San Bushmen. If you are interested in joining us, please visit this website – and contact us as swiftly as possible.